If you were a struggling artist in the early 1900s, Romany Marie (left) was your ally. Born in Moldavia, the former anarchist came to Greenwich Village in the early 1900s, when the neighborhood was gathering steam as a hotbed of radical politics and artistic creativity. For the next several decades she ran a series of dimly lit tea rooms and taverns offering gypsy music, cheap eats, and a salon-like vibe where ideas flowed freely. Oh, and she sometimes fed artists for free when they couldn’t afford a meal. No wonder she attracted such a devoted following of Village bohemians. John Sloan’s famous sketch, “Romany Marye’s in Christopher Street, 1922” (above) was drawn at her 20 Christopher Street restaurant. Poet Edna St. Vincent Millay wrote her famous “my candle burns at both ends” line there. 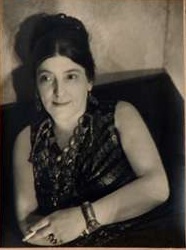 Romany Marie also ran establishments at 15 Minetta Street, 49 Grove Street, and 64 Washington Square South at Thompson Street. She died in 1961, when the Village still had its bohemian rep but was a very different place. The Village Voice blog Runnin’ Scared reran her obituary here. 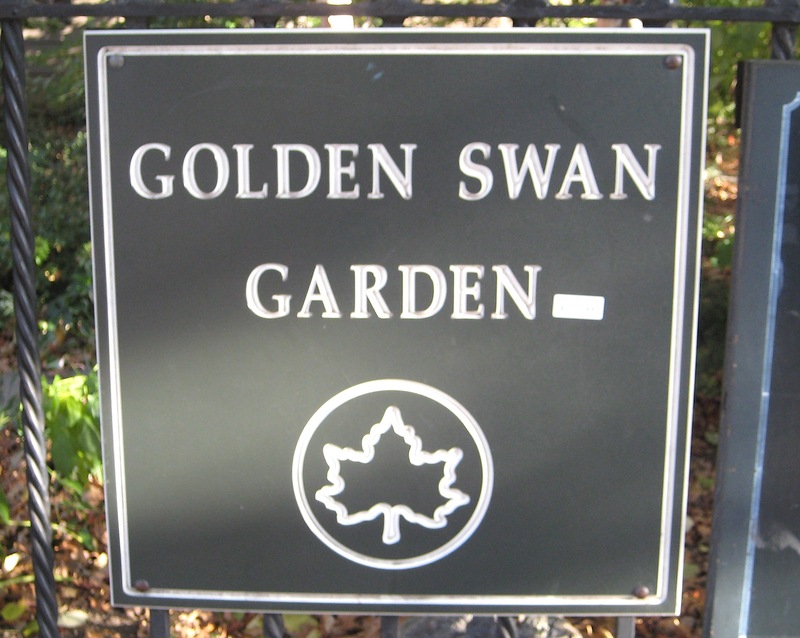 Golden Swan Garden, a tiny triangle at Sixth Avenue and West Fourth Street, has got to be the only city park named after a rough-and-tumble saloon. But that’s what the Golden Swan was. 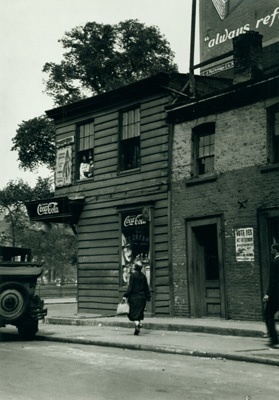 Nicknamed the Hell Hole and the Bucket o’ Blood, this seedy gathering place stood at this corner in the early 1900s—when the West Village was a shabby mixed-race neighborhood of boarding houses and bars, not boutiques. 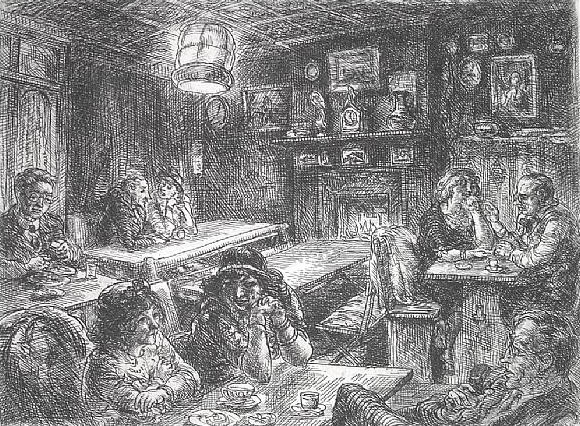 Dingy and divey, the Golden Swan was run by an ex-prize fighter and attracted locals as well as artists drawn to the seedy side of life. 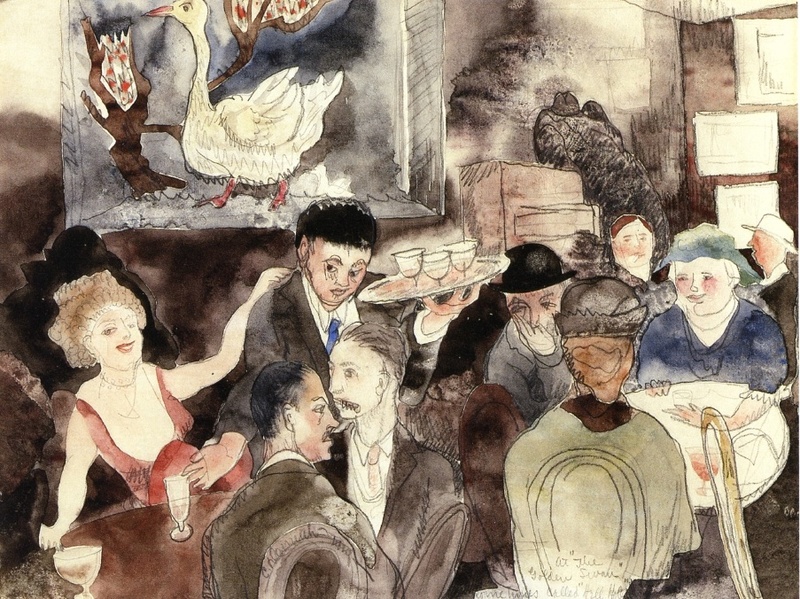 Painters John Sloan and Charles Demuth (that’s his lively depiction of the bar’s back room, above) captured it on canvas. Gangsters like the Hudson Dusters made it their hangout. Playwright and drunk Eugene O’Neill, left, who often had to be fished out of the Golden Swan for rehearsals at the nearby Provincetown Playhouse, set The Iceman Cometh there. The end came in 1922, and the building was demolished a few years later during construction of the Sixth Avenue subway. All that remains is the garden. 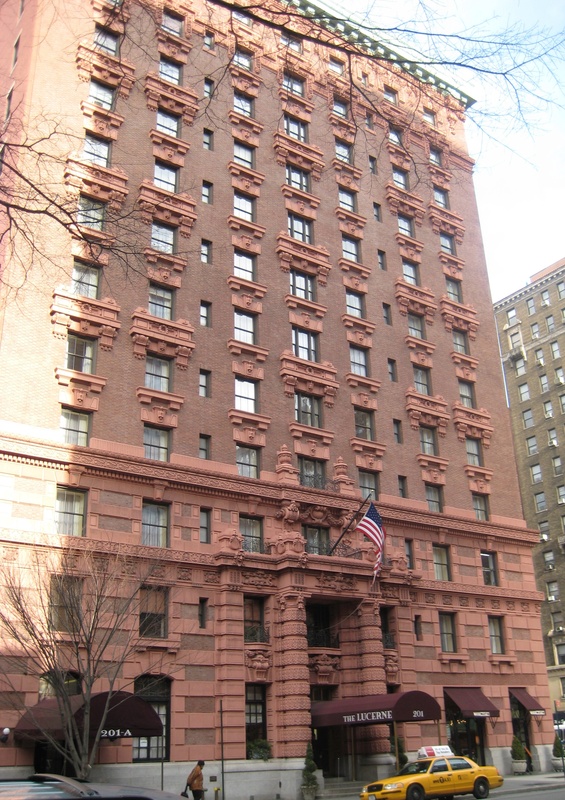 The salmon-pink beaux-arts structure on the corner of 79th Street and Amsterdam Avenue is the Lucerne Hotel—formerly the Hotel Lucerne. 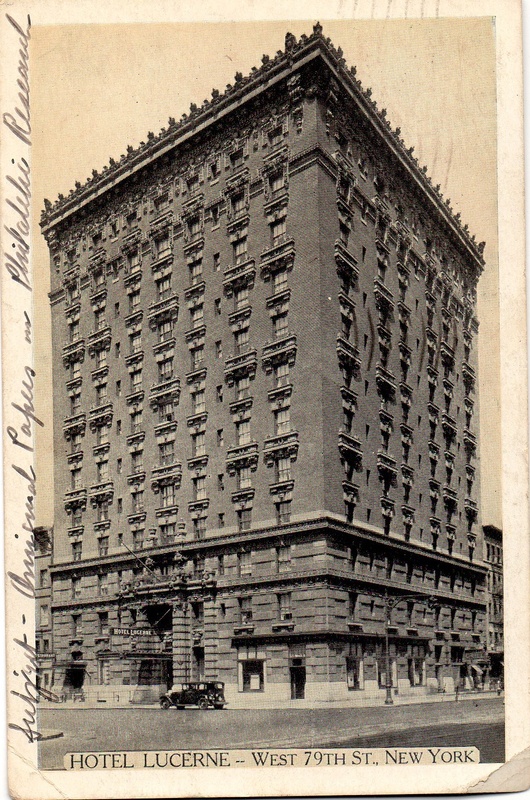 Built in 1903, it was billed as “fireproof and quiet, in the pleasing part of New York” on the back of this promotional postcard. 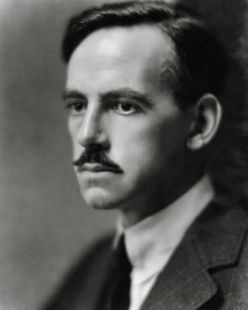 In the early 20th century, the Lucerne was home to lots of movers and shakers—including Eugene O’Neill, who listed it as his address while away at school at Princeton University in 1907. His parents maintained a residence there.